(1964) "How Sweet It Is (To Be Loved by You)"
"How Sweet It Is (To Be Loved by You)" is a song recorded by American soul singer Marvin Gaye from his fifth studio album, How Sweet It Is to Be Loved by You (1965). It was written in 1964 by the Motown songwriting team of Holland–Dozier–Holland, and produced by Brian Holland and Lamont Dozier. Produced by Brian Holland and Lamont Dozier, the song was released as a single in September 1964. It peaked at number six on the US Billboard Hot 100 chart in January 1965 and at number three on US Billboard's R&B Singles chart. Up to that point, it was Gaye's most successful single with record sales exceeding 900,000 copies. The song's personnel includes Marvin Gaye on lead vocals; The Andantes on background vocals; and The Funk Brothers on various instruments, including piano and percussion. Gaye also released a German-language version of the song entitled "Wie Schön Das Ist". AllMusic critic Jason Ankeny described the song as a "radiant pop confection," noting that it was unusual for Gaye in being a "straightforward love song" that doesn't reflect Gaye's usual demons. Ankeny commented on the soulfulness of the song, and particularly noted the piano riff. Gaye's recording has subsequently been released on many greatest hits albums. Since Marvin Gaye's original 1964 release, "How Sweet It Is (To Be Loved by You)" has been recorded by artists in a variety of genres including soul, pop, gospel, folk, and country. It was a staple for the Jerry Garcia Band in the 1970s, 1980's and 1990's, often used as the opening song. In 1966, Junior Walker & the All Stars released the song as a single, which reached number 3 on the R&B Singles chart and No. 18 on the Billboard Hot 100 chart. According to Jason Ankeny of AllMusic, this version makes up in grit what it lacks in Gaye's grace, increasing the "celebratory" feel of the song. Ankeny described the version as "a rollicking floor-shaker fueled by his smoldering saxophone." The drums are played by James Graves (1941-1967). A Grateful Dead version is popular among the crowd despite they have only played it live once (3/25/72). It was a staple of the Jerry Garcia band though from 1972 to 1995. James Taylor released his version of "How Sweet It Is (To Be Loved by You)" as the lead single from his album Gorilla (1975). Taylor's 1975 single has been the most successful remake of the song to date, hitting number one on the Easy Listening chart and number five on the US Billboard Hot 100 chart. 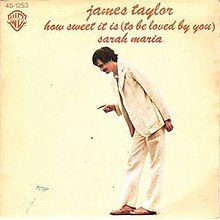 In addition to James Taylor on lead vocals and guitar, other personnel include Carly Simon on harmony vocals, David Sanborn on saxophone, Clarence McDonald on piano, Fender Rhodes electric piano and possibly ARP String Ensemble, Lee Sklar on bass guitar and both Jim Keltner and Russ Kunkel on drums with Kunkel doubling on tambourine. Author Ian Halperin believes that the song was included on Gorilla as a tribute to Simon, who was then his wife. It was produced by Lenny Waronker and Russ Titelman. After his success with "How Sweet It Is (To Be Loved By You)," Taylor continued to record R&B hits applying his soft rock approach. Rolling Stone critic Bud Scoppa described Taylor's version as "a relaxed rendition" and considered it to be Taylor's way of acknowledging Gaye as a source of inspiration for Taylor's romantic point of view at the time. Music critic Robert Christgau regarded Taylor's version as a "desecration of Marvin Gaye." Taylor biographer Timothy White described it as "music for the park on Sunday." Taylor's version has been released on many live and compilation albums. These include the compilation albums Greatest Hits (1976), Classic Songs (1990), The Best of James Taylor (2003) and The Essential James Taylor (2013). Live versions have been included on Live and Live at the Beacon Theater. In a web-only exclusive, The Simpsons released a video highlighting the 2016 presidential election. In it, Marge is struggling to sleep because she is frustrated that basic manners are gone from politics. Homer convinces her to imagine a world in which the candidates are cordial with each other. The candidates briefly sing the song before going back to fighting again. ^ "Marvin Gaye awards". Allmusic. Retrieved 2014-04-14. ^ Gilliland, John (1969). "Show 26 - The Soul Reformation: Phase two, the Motown story. [Part 5]" (audio). Pop Chronicles. University of North Texas Libraries. ^ a b c d e Ankeny, J. "How Sweet It Is (To Be Loved by You)". AllMusic. Retrieved 2014-04-14. ^ "UK Official Singles Chart". UK Official Charts Company. December 16, 1964. Retrieved March 9, 2018. ^ "Hot R&B/Hip-Hop Songs Chart - Billboard". Billboard. January 9, 1965. Retrieved March 2, 2019. ^ "Cash Box Top 100 Singles, January 30, 1965". Retrieved 18 April 2018. ^ "Top 100 Hits of 1965/Top 100 Songs of 1965". www.musicoutfitters.com. Retrieved August 20, 2017. ^ Talevski, Nick (7 April 2010). "Rock Obituaries - Knocking On Heaven's Door". Omnibus Press. Retrieved August 20, 2017 – via Google Books. ^ a b Ruhlmann, W. "Gorilla". Allmusic. Retrieved 2014-04-12. ^ Whitburn, Joel (2002). Top Adult Contemporary: 1961-2001. Record Research. p. 239. ^ a b White, T. (2009). Long Ago and Far Away. Omnibus Press. pp. 233–235. ISBN 9780857120069. ^ a b Halperin, I. (2003). Fire and Rain: The James Taylor Story. Citadel. pp. 166–167. ISBN 978 0806523484. ^ Scoppa, B. (July 17, 1975). "Gorilla". Rolling Stone. Retrieved 2014-04-12. ^ Christgau, R. "James Taylor". robertchristgau.com. Retrieved 2014-04-12. ^ Ruhlmann, W. "Greatest Hits". Allmusic. Retrieved 2014-04-12. ^ Woodstra, C. "Classic Songs". Allmusic. Retrieved 2014-04-12. ^ Jurek, T. "The Best of James Taylor". Allmusic. Retrieved 2014-04-12. ^ Collar, M. "The Essential James Taylor". Allmusic. Retrieved 2014-04-12. ^ "Classic Tracks: "How Sweet It Is (to Be Loved by You)"". Retrieved 18 April 2018. ^ "Item Display - RPM - Library and Archives Canada". Collectionscanada.gc.ca. 1975-09-06. Retrieved 2018-07-03. ^ "RPM Weekly Top Singles August 23, 1975 (Volume 23, No. 26)". Library and Archives Canada. RPM Weekly (archived). Archived from the original on February 12, 2018. Retrieved February 12, 2018. ^ "Cash Box Top 100 8/16/75". tropicalglen.com. Retrieved 20 August 2017. ^ Lyttle, Brendan. "Top 200 Singles of 1975". Library and Archives Canada. RPM Weekly (archived). Retrieved February 25, 2018. ^ "Top 100 Hits of 1975/Top 100 Songs of 1975". www.musicoutfitters.com. Retrieved 20 August 2017. ^ "The Cash Box Year-End Charts - 1975". tropicalglen.com. December 27, 1975. Retrieved February 27, 2017. ^ Stedman, Alex (February 21, 2016). "Watch: 'The Simpsons' Mocks 2016 Presidential Candidates in 'The Debateful Eight'". Variety. Retrieved 2016-02-21. This page was last edited on 23 April 2019, at 16:17 (UTC).